As for childhood obesity, the Centers for Disease Control and Prevention (CDC) report that 12.7 million children in the U.S. – or approximately 17 percent – are obese. The researchers examined the medical records of 2,171 non-obese children between 5-8 years old. These children were enrolled in the Southern California Children’s Health Study (CHS) and were clinically followed for 10 years. The USC researchers examined 10 years’ worth of data collected in the CHS, and they also performed a replication analysis on an independent sample of 2,684 CHS children. This latter cohort was followed from the average age of 9.7 years to 17.8 years. During this time, researchers measured the children’s height and weight annually, categorizing them into normal, overweight, and obese. Children were deemed overweight or obese if their body mass index (BMI) was at or above the 85th and 95th percentile, respectively, compared with the BMI standards set by the CDC. 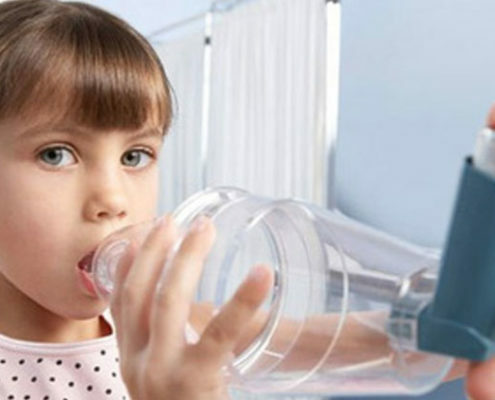 Researchers team assessed the children’s asthma using the physician’s diagnosis as reported by the children or by their parents. Some of the study’s limitations include the fact that the information was self-reported, and that the scientists did not have access to sufficient information regarding diet or physical activity patterns. Frank Gilliland, the study’s senior author, points out that a combination of asthma and obesity can trigger other metabolic diseases in adulthood, including prediabetes and type 2 diabetes. Children who have asthma are often overweight or obese, but the scientific literature has not been able to say asthma causes obesity. However, our study and that of others support the finding that having asthma in early childhood may lead to increased risk of childhood obesity. Early diagnosis and treatment of asthma may help prevent the childhood obesity epidemic. Part of the problem may be a vicious cycle where asthma and obesity negatively affect each other. Our results also suggest that asthma inhalers may help prevent obesity in children. Although this observation warrants further study, it is interesting that the correlation exists irrespective of physical activity and other asthma medication use. Engaging in physical activity can reduce pain and help to maintain mobility and independence for older adults with arthritis, but current exercise recommendations are often unachievable for this population. Now, however, a new study finds that exercising for just 45 minutes is enough to reap the benefits. Researchers say that 45 minutes of moderate-intensity exercise per week can benefit older adults with arthritis. 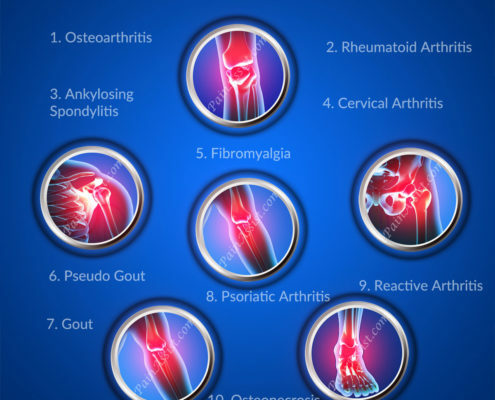 #Arthritis is a term used to describe inflammation of the joints. Osteoarthritis (OA) is the most common form of arthritis, caused by “wear and tear” of cartilage that protects the joints. As the cartilage breaks down, pain, swelling, and joint movement problems may occur. However, according to our last study only 1 in 10 older U.S. adults with knee OA meet these recommendations. This is most likely because they find such guidelines unachievable with their condition. We found the most effective type of activity to maintain or improve your function 2 years later was moderate activity, and it did not need to be done in sessions lasting 10 minutes or more, as recommended by federal guidelines. Even a little activity is better than none. For those older people suffering from arthritis who are minimally active, a 45-minute minimum might feel more realistic. As 2017 arrived, many of us are thinking about the healthy lifestyle changes we want to make for the coming year. Do you plan to exercise more? Lose weight? Quit smoking? How about cutting down on alcohol intake? While that last question may have prompted a highly resistant shake of the head from many readers who enjoy their after-work beer or a glass of wine with dinner, there is no better time to review your alcohol intake. Popularized by British organization Alcohol Concern, Dry January aims to “change the conversation” about alcohol by encouraging people to stop drinking for 1 month. The Dietary Guidelines for Americans 2015-2020 recommend that adults who drink alcohol should only do so in moderation – that is, up to one alcoholic beverage a day for women and two for men. However, the National Institute on Alcohol Abuse and Alcoholism (NIAAA) report that in 2014, almost a quarter of adults in the United States engaged in binge drinking – consumption of around four drinks for women and five for men in a 2-hour period – over the past month. The NIAAA explain that alcohol disrupts communication between nerve cells in the brain by causing an imbalance in the levels of neurotransmitters – the chemicals that relay signals from one nerve cell to another. Drinking too much – particularly over a long period of time – can also lead to high blood pressure, arrhythmia (irregular heartbeat), cardiomyopathy (enlargement of the heart muscle), and stroke. It should be mentioned, however, that an increasing number of studies have suggested that moderate drinking may actually benefit heart health. A study reported by Medical News, linked moderate alcohol intake to reduced risk of heart attack and heart failure. Still, some researchers have questioned the heart health benefits of moderate drinking, and health organizations recommend not initiating alcohol consumption solely to reap such – as yet unproven – rewards. 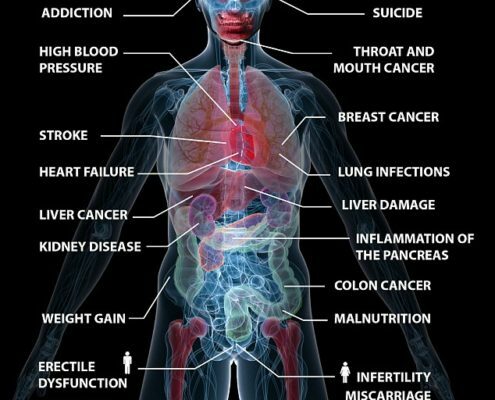 Heavy alcohol intake can lead to alcoholic fatty liver disease – characterized by a buildup of fat in the arteries – alcoholic hepatitis (inflammation of the liver), and alcoholic cirrhosis (severe liver scarring and structural damage). The NIAAA’s alcohol calorie calculator can help you work out how many calories you consume from alcoholic beverages each week. Alcohol intake – especially in large quantities – can interfere with the neurotransmitters that regulate mood, increasing the risk of anxiety, stress, and depression. Studies have shown that alcohol can disrupt sleep. Research reported by MNT in 2014, for example, found that drinking can interfere with the body’s ability to regulate sleepiness and wakefulness, which can lead to insomnia. Dr. Shawn Adhami recommends steering clear of drinking just before bedtime, as this can disrupt normal sleep patterns. Deep sleep is when the body restores itself, and alcohol can interfere with this,” he explains. As the alcohol starts to wear off, your body can come out of deep sleep and back into REM [rapid eye movement] sleep, which is much easier to wake from. That’s why you often wake up after just a few hours sleep when you’ve been drinking. It is no surprise, then, that cutting down on drinking can mean a better night’s sleep; a survey from Alcohol Concern found that 62 percent of participants who took part in Dry January reported sleep improvements. * Avoid drinking on an empty stomach: eating food alongside an alcoholic beverage means that the alcohol will be absorbed into the bloodstream more slowly.